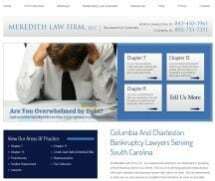 At Meredith Law Firm, LLC, our bankruptcy attorneys have years of experience and knowledge. They will help you to determine which form of bankruptcy is best for your particular needs, promptly file your case and will represent you to the fullest before a bankruptcy trustee. Protecting our clients’ interests is our top priority. If you would like to discuss your bankruptcy case with one of our knowledgeable attorneys, contact us today to schedule your free initial consultation. Our North Charleston and Columbia offices are open Monday through Friday from 8:30 a.m. to 5:30 p.m. We look forward to helping you with your personal or business debt relief needs.